A Saudi prince arrested for criticising a crackdown on corruption is reported to have been freed from detention. Relatives of Prince Khaled bin Talal shared pictures on social media, purportedly taken this weekend, showing the prince greeting his family. The prince, who was held for nearly a year, is a nephew of King Salman. Prince Khaled's brother, Prince Alwaleed bin Talal, was among dozens of princes and other senior figures held in a corruption drive late last year. The latest move comes amid intense pressure on Saudi Crown Prince Mohammed bin Salman over the murder of journalist Jamal Khashoggi. Analysts say Saudi authorities appear to be trying to defuse the crisis by shoring up support from within the royal family. Who is Saudi Crown Prince Mohammed? "Thank god for your safety," tweeted Prince Khaled's niece, Princess Reem bint Alwaleed, posting images of him with other family members. The Saudi government has given no official explanation for his detention, or for his apparent release. But the Wall Street Journal reported that he was held for 11 months for criticising last year's mass detention of more than 200 princes, ministers and businessmen over allegations of corruption. 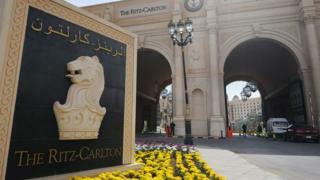 They were held in hotels in the capital Riyadh, including in the five-star Ritz-Carlton. Analysts suggested that operation was an attempt by the crown prince to consolidate power. At the end of January the Saudi prosecutor general's office said more than $100bn (£77bn) had been recovered following financial settlements with those being held.